The tragedy that befell Weliweriya has given early Christmas for those who had been splitting hairs wondering how to serve their sponsors to showcase a state of chaos in Sri Lanka. The usual coterie of anti-Sri Lankan destabilizing operators some of whom are columnists were quick to action writing aggrieved accounts about the incident claiming they could not sleep thinking about the 3 deaths. We wonder how they slept through 3 decades of terror with people blown to pieces virtually every day or their lack of sleep about the fatalities that occur daily as a result of reckless driving. However, we need to separate the issue of Weliweriya by first identifying the factors that led to the demand for unpolluted drinking water, which the residents of the area had every right to do and then to establish what mischief took place after an agreement was reached following extensive discussions between all stakeholders initiated by the Defense Secretary and it was agreed to test the drinking water and conduct necessary investigations and provide temporary drinking water supply for the people deprived of proper drinking water. When the same lot of people gang up together and come up with the same set of notions joined by the US embassy quick to issue a statement we have to wonder that there is something far more than protesting against drinking water. This is the very country responsible for over 50 covert operations that have overthrown legitimate governments and propped puppet dictators and some of the locals pointing finger are direct recipients of funds meant to facilitate regime change in Sri Lanka. We cannot therefore disassociate these realities from the tragedy that took place in Weliweriya. Let us therefore, first disentangle the issue from the eventual tragedy and look at the issue itself. Post-Weliweriya has turned to be everything but solving the drinking water crisis. The headlines were easy to decipher. The aim was to build up a notion that the Sri Lankan military was not the “disciplined” force it projects itself to be, the “water crisis” was no different to “Mavil Aru” that set off the end of the LTTE, Thursday Black July was sufficient to draw the gavel of guilt on Friday Black July, the “shootings” were enough reason to conclude that the army is guilty of war crimes, shooting at people who raise their hands in surrender and inside a Church was a dead giveaway – all these similes were meant to juxtapose the Weliweriya event with May 2009, and the icing on the cake came with a newspaper claiming that the supposedly “extremist Buddhist monk” associated with the Bodhu Bala Sena gave orders for the army to enter Weliweriya and thus diminish the status of the army while showing Buddhist extremism at its height with Buddhists ordering the killing of Buddhists – a new phenomena being established to distance the public from their war heroes. The commenting coterie also happens to be the same set of people who were LTTE sympathizers and there is sufficient material available that depicts their open sympathy for the LTTE though it is irrelevant for the present discussion. Nevertheless, they are all going along the same garden path and that is what is relevant. The same set demand police and land powers for the Northern province, incidentally the party contesting were also representatives of the Tamil people in other provinces but the campaign propaganda did not rest on land and police for these provinces as is the case presently. This is why at every turn situations like Weliweriya are twisted to conclude what they said was right and what the army did was wrong. If according to their recipe of governance – to get rid of the Government, what next is never answered? Alll the nations that fell for this slogan are today feeling sorry for being naïve to buy the lies – just ask any Egyptian, Libyan and even those from Kosovo or Haiti. Let it b e also known that these very commentators defended these “liberation” movements too and did not speak a word on the atrocities being committed by US and NATO in Iraq, Afghanistan or on the unmanned drone attacks killing scores of civilians. The answer to this question can be revealed in the video footage that is now under judicial review and probably under military investigation too. Nevertheless, what needs to be ascertained from the images is to differentiate who were the residents and who were not. This will be a vital clue as to pin point the elements that turned a “peaceful” protest into one of mayhem. As for mayhem situations it is not difficult for any to throw a stone and for that action to become contagious corresponding with a few emotional lines. Not too recently we heard of how school children went amok and totally ruined the new principal’s vehicle. Human beings are emotional, the people of Weliweriya came out to protest on 27th July 2013, the meeting with the Defense Secretary took place on 1st August 2013 reaching an amicable conclusion – there was enough time to galvanize forces and create the planned “Spring”. Therefore, the authorities must look at the footage and reveal all persons not associated with the water issue who turned up to create the eventual mayhem. Let us also not forget that while the accusing finger points at the army there are also plenty of army deserters who continue to posses military fatigue and many of the recent crimes that have taken place have been led by these army deserters. So there is no ruling out of such individuals also being used. Be that as it may just like July 83 was conveniently turned to project the notion that the Sinhalese Buddhists burnt and destroyed Tamil homes which was far from the truth, the army cannot be held responsible if protestors are provoking an onslaught. A photo of a man aiming a blunt weapon at a soldier from behind and others carrying poles give much to the imagination. Just as a son mourns the death of his father, a soldiers son is also human and we cannot expect soldiers to stand and take onslaughts without defending themselves. Their job is not to stand still and watch petrol bombs thrown at them just to please a set of people who had all through 3 decades wanted the army to function as guinea pigs for LTTE weapon tests! Much of what can be answered will be answered when the judicial inquiry concludes therefore the questions that needs to be answered will probably emerge in a few days time. However, we need to first ascertain how far “protestors” can be defined as “peaceful” if they use any type of weapon that can create harm to another. How can protestors carry bottles, Petrol bombs, swords, stones, if it is a peaceful protest? Possession of such does not meet the criteria for peaceful protestors. However, what must then be ascertained is whether the people in possession of these “ammunition” were in fact residents of Weliweriya or whether they were thugs brought in by vested interest groups to create the necessary Spring that is now part and parcel of crisis situations all over the world. In Asian and African continents it is somewhat difficult to use white regime change operatives at the fore front of situations and therefore the planning goes on interior and the locals are generally paid to do the dirty work. Let us not forget that it took just ONE CIA man to overthrow a democratic Government in Iran and place the Shah in power and he did the job by paying Iranian men to stage public protests and put up placards and posters against President Mossadegh who was deposed. So when US issues statements we hope that US does not think that we do not know or remember its history of deposing legitimate governments. The US issuing a message of concern to Sri Lanka may like to kindly refer to the investigation undertaken by law clinics at NYU, Fordham, Harvard, and Stanford has concluded, after eight months of study, that the NYPD abused Occupy Wall Street protesters and violated their rights on numerous occasions during the 2011 protests. “According to journalist David Lindorff, the FBI planned to assassinate the leaders of the now moribund Occupy movement ‘via suppressed sniper rifles,” In the latest example of racism following the verdict in favor of Zimmermen a wave of protests throughout the US also turned violent and these “peaceful protestors” were arrested by the US police wearing heavy body armour! Weliweriya was certainly a curtain raiser and was just perfect for the necessary conclusions that have been quick to reach print and these are certainly perfect as a backdrop to the arrival of the UNHRC head ever ready to issue statements against Sri Lanka and the hosting of CHOGM for despite confirming their presence foreign parliamentarians must sing for their additional perks through veiled threats that are meant to turn the heat on Sri Lanka’s organizers who should be wondering for what reason a former colony should be commemorating the brutalities that were part of colonial rule but then even the Opposition Leader wanted the country to celebrate the arrival of the Portuguese oblivious to the crimes committed during Portuguese rule! The media to regain its credibility must first accept its foul methods of fooling the public. We are well aware of how the mainstream media had lied about the Iraq War, the fabrications of bombings and attacks in Syria, how they had not even been at the scene of crimes but used false footage to reveal lies to gullible watchers and how even photographs had been used over the years to fool the people. In this context we cannot accept as the TRUTH all that the media relays and people should not be naïve enough to accept these notions either. Weliweriya incident also shows the authorities how easy it is to turn innocent situations into uncontrollable events. The Welweriya incident would never have taken place had the authorities who were paid to do their jobs did their job properly and officials must take direct blame for the situation including politicians. The President must ensure that the present manner Provincial Councilors and local authorities function improves without excuses – all people ask is drinking water, a road, proper facilities – is that too much to deliver? 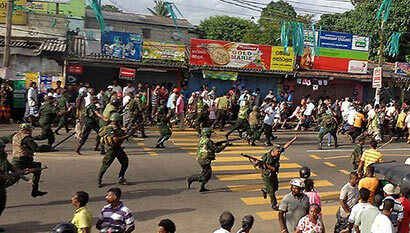 Regularly we see numbers of protests rising in Sri Lanka. Some of these have very valid reasons and they all conclude to one simple fact. Public service mechanism is in disarray – Public officials are not taking decisions that they are paid to take, politicians are ruining the country by thinking that once elected they can do what they like, when they like and to whom they like. Now these are the factors that all political parties now need to wake up and change. People are not prepared to be pushed around from one table to the other, to be frustrated by their lethargy and waste. Giving safe drinking water is a fundamental right of all citizens of Sri Lanka. If the residents claim that a factory located in the area is contributing towards the pollution of the water, these residents would have made the necessary complaints over a number of years. Why has no action being taken? Waste by factories contributing to water pollution is even written and taught in school text books therefore, the authorities concerned should have investigated the complaints far before it reached this level and taken action. Does the factory have necessary approvals by local authorities, was the waste of their glove manufacture discussed before approvals were given, where was this waste water to be diverted and did the authorities look at the possibilities of the well water of the residents getting affected BEFORE approvals were given to set up the factory or was the fact that a big investment was being made sufficient enough to overrule all criteria that should have been looked into especially the needs of these residents? These are the questions that people should be asking and not the innuendoes that are being thrown for they provide no answers but attempt to create further chaos and incite emotional elements into action. The issue is the water problem – can we return to that problem and solve it without taking the issues in all sorts of directions. The people of Weliweriya have no requirement for the political debates juxtaposing one incident with another nor do they need to be told that the army of the police is against them simply because it suits other people’s agenda. Drinking water was what brought the residents to the streets in protest having exhausted all other avenues, therefore this is what the lethargic officials need to wake up and address. In the meanwhile, the investigations into the mayhem that caused the deaths must take its course and the rest of the public must be appraised of the handful of miscreants who are being outsourced to create mischief no different to the imported “public” that caused the fall of Libya and now Syria.